OMG! RAMYA KRISHNAN'S ROLE WAS INITIALLY OFFERED TO THIS LADY SUPERSTAR? Ramya Krishnan who played the role of Sivagami in Baahubali did absolute justice to the character. But, do you know the character initially went to Lady Superstar Sridevi? Yes, if sources are to be believed SS Rajamouli approached Sridevi for the Sivagami character, and it is believed due to high remuneration the producers had to give up on Sridevi. 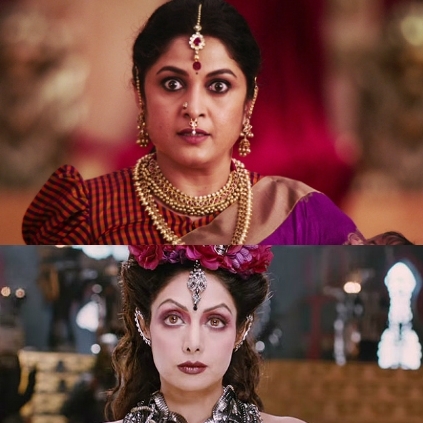 Sivagami character had a substantial impact on the film, it was both critically acclaimed and loved by the fans. But, what if Sridevi would have done that role? It would have been a perfect film after English Vinglish for her. Well, all that we can say is Sridevi missed being part of such a prestigious film while Ramya Krishnan just grabbed the opportunity to the fullest. Vijay Sethupathi’s heroine marriage rumour : Popular star reacts! Exclusive: Bairavaa’s reception was the reason! More details on Sangamithra at the Cannes! Why is Priyanka's latest saree trending? Check here! It’s May 15 for Arjun’s 150th film! Ramya Krishnan To Pair Up With Kamal Haasan After 14 Years. People looking for online information on Baahubali, Ramya Krishnan, Sridevi, SS Rajamouli will find this news story useful.